This month you can investigate a missing girl in a strange Victorian town or some supernatural graffiti as a zombie detective. You could also go back to 17th century France to save prisoners from the Bastille, or forward to an electronic future to rescue your favourite robot. Alternatively, you can travel to far-off lands looking for treasure, or stay on the beach helping people in need. You can even seek entrance to a school for second-rate heroes, if you can pass its final test. 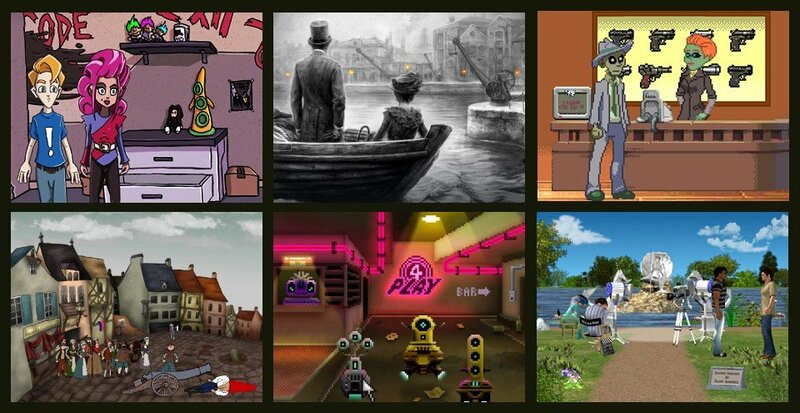 All these await you in this month's round-up of releases from the freeware scene. Many a tale is told of brave heroes with incredible powers who defeat the villains and save the world. Sadly, such adulation is not for all, as there are many whose powers are not so impressive. Fortunately there is a place where such lesser individuals can go to start a career in heroism: Sidekick High, the school that trains weaker characters who support the real heroes. The latest recruits have successfully passed the strength and velocity tests, and now only face the brain challenge to see if they qualify for entrance. Split into two teams locked in separate rooms, they have 60 minutes to escape. Succeed and they will start their training. Fail and they will die. CMMN CLRS present the toughest ever entrance exam in Sidekick High. The hand-drawn graphics are somewhat cartoony in nature, with colours reminiscent of a comic book. 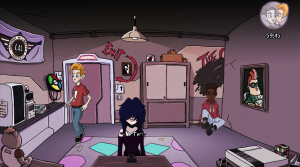 The characters are also slightly exaggerated in style, including a miserable goth girl and a fat and nervous nerd, though they are animated smoothly with expressive faces that convey their feelings well. The entire game takes place in two rooms that mirror one another in layout, though the contents of the two are very different. All characters are voiced to a very high standard, including the narrator who gives a sales pitch for the school over the opening menu. The intro has a heroic trumpet tune backing it, whilst the main action is accompanied by a mellow synthesiser piece. There are also a variety of sound effects, the most pleasing being a heroic chime that plays when you advance your goals. Control is mouse-driven, with left-click interacting and right-click looking. Holding the space bar highlights hotspots, though this is generally not necessary. Another keystroke calls up the inventory, from which items can be selected for combination or for use with people or objects. The students include twins with a psychic link that you control throughout the game, though here they’ve been separated into opposite teams. Clicking an on-screen button allows you to switch between them at will, a feature you will frequently use. Your classmates’ powers on both teams are key to your goals, though turning into a slug under a certain sort of light and being able to produce coffee at will do not seem useful abilities at first. You will also need to find a way to pass inventory back and forth, as most puzzles require objects from the other room. Each room is secured by two locks, which include both colour and musical combinations. 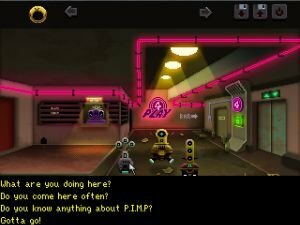 The whole game plays as a parody of superhero tropes, with some extremely humorous dialogue. The 60 minute limit counts down on-screen throughout, but this time will mainly be for bragging rights, as most players should expect to escape with plenty of time to spare. Originally created as part of the 2017 Adventure Jam, the updated version of Sidekick High can be downloaded from Game Jolt. Working away at his job with his robot friends, LO43R discusses plans for the coming weekend. He is shocked to find that the love of his life, G1R7, has been coerced into joining the 4Play massage parlour by P.I.M.P droid iGore. Pausing only to grab his trusty drone from his locker, our hero sets out to rescue his beloved from this terrible fate. But iGore is a powerful and dangerous opponent. LO43R stands no chance in a direct confrontation, so a more devious approach is required. BRANE and Tycho have created a technological love story in Robolovers. The graphics are presented in pixel art with plenty of background detail. From the small office where you start, you will travel to the massage parlour, lit by garish pink neon. All the robots in the game hover, gently bobbing up and down on their jets even when they are not moving about. There are also background animations, including a fly that hovers near iGore. Music ranges from a mellow guitar piece to a jaunty synthesiser and snare tune. Sound effects are mostly electronic in nature, with the jets making a rushing noise when you move, and various controls bleeping as you interact with them. Unsurprisingly given the storyline, the script has some adult humour, making it unsuitable for younger gamers. However, the jokes are only mildly dirty in nature and there is no graphic content to be concerned about. Whilst you will mostly control the protagonist, you will also need to make extensive use of his drone. Once picked up, an on-screen button switches control to the drone, which can fly higher than its owner and fit into small spaces. The combination for a door lock is hidden in a fiendishly difficult standalone puzzle, and you will need to improvise some repairs and frighten off a fearsome guard bot. Robolovers can be downloaded from the AGS website. For fishmonger and housewife Josiane, this was expected to be an ordinary day. Then she heard the cries of anguish and pain within the walls of the Bastille. Compelled by one of the prisoners calling from their cell, she resolves to free those incarcerated there. But the Bastille is heavily fortified and full of the Royal Guard. A lone woman will never be able to breach such a defense on her own. Perhaps if she can incite the local peasantry into a revolution of some sort, she can achieve her aim. 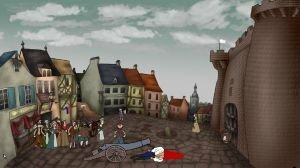 Blondbraid and Creamy have taken a brutal piece of history and made a surprisingly humorous game in Busting the Bastille. The background art is stylised yet moderately realistic, with stone effects on the walls and other fine detail. You start in Josiane's run-down house, but your journey will take you deep into the famous fortress. The characters are drawn in a somewhat simpler, more cartoon-like style with exaggerated features. The latter are simply animated, with only a few frames of movement, but this works well in context. The ambient music is a string, pipe and choral piece that fits in nicely with the French Revolution setting. There are also a handful of sound effects, such as the twang of a slingshot being fired and the roar of a crowd. Whilst the broad details of the storming of the Bastille are covered in the game, the approach is very tongue-in-cheek. You will end up creating a familiar looking flag from some unusual parts and improvise a means of opening a door without the right key. A cannon in the square outside the Bastille provides an interesting problem which is worth revisiting. There is also a small arcade section, where you dodge from cover to cover leading a crowd of peasants through some cannon fire. Provided you make use of the available cover, most players should complete this with health to spare. There are also plenty of optional dialogues, most notably with Josiane's husband, which provide additional dark humour. Busting the Bastille can be downloaded from the AGS website. You've enjoyed working as a lifeguard at the beach, but now your stint there is coming to an end. Today is your last day on the job, and you intend to make it a good one. You've made some close friends with the regulars in your time here, so you take the opportunity to help them out one last time. You might even be able to leave mementos behind for them to remember you when you're gone. With Bury Me in the Sand, Definitely Mortal gives us a summery game with a retro feel. The graphics are done in a chunky pixel style, with a limited colour palette reminiscent of early home computers. Whilst the results are somewhat garish, this actually works well with the bright and sunny setting, the game taking place entirely on the beach, though this includes an area under a dock and the lifeguard hut. Relevant people and objects are rendered large enough to be recognisable, and the animation is basic but effective. Across most of the beach, only background sounds are heard, including the whine of a remote control plane and the gentle splash of waves. There is easy listening music playing in one area, however, rendered as if playing through a small portable radio. This is a gentle dual-button game (left to use, right to observe), the player helping with mundane tasks instead of going on a grand quest. You will find soothing treatment for a man with a bad case of sunburn and figure out a way to silence a noisy car disrupting the peace. You will also need to discover a locker code, in the process helping out a friend who should have found the code memorable. You make use of a small amount of inventory, carried in a zip pouch displayed at the bottom of the screen. Whilst dialogues with other characters aren't extensive, they do effectively convey the impression that you have formed lasting relationships with the other denizens of the beach. Bury Me in the Sand can be downloaded from the AGS website.